I recently came across the Intel Extreme Tuning Utility for Windows. 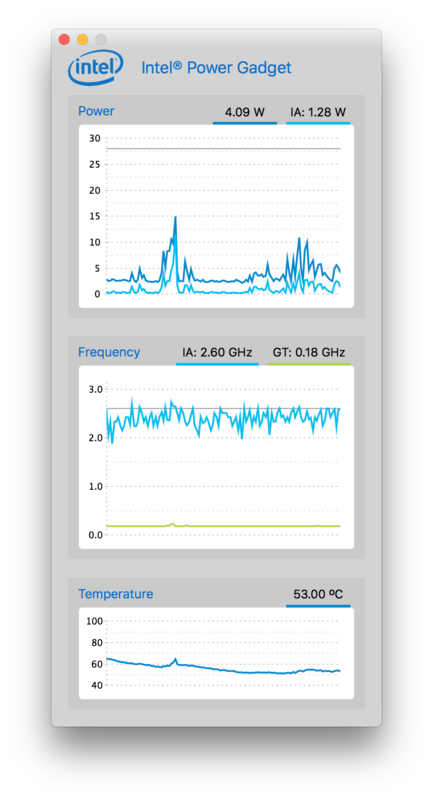 I tried it under Bootcamp Windows and it was very interesting to learn in what situations my MacBook Pro's (mid2012) CPU is doing thermal throttling. The tool is also designed to change the CPU's voltage, in order to reduce thermal throttling. However, this option was not available. Why was the option to alter the CPU voltage not available under Bootcamp? Is this feature not supported by my CPU (i7 2.6 GHz Ivy Bridge 3720QM)? If my CPU is capable of changing its voltage, is there a way to reduce CPU voltage in OS X? The official Intel Power Gadget has a Mac version. I would also like a utility to perform this function. I don't know how to monitor this in OSX, but there is a way to reduce it: SMC Fan Control. This utility allows you to manually set your fans' speeds, which will cool the machine, reducing the throttling somewhat. Not the answer you're looking for? Browse other questions tagged macos yosemite hardware performance cpu . How can I disable CPU throttling and CPU disabling?